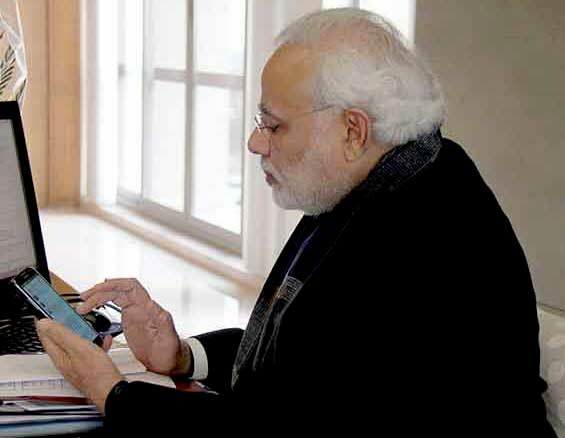 New Delhi : As we knows that every popular personalities hire assistants to handle their social media accounts, like - Facebook, Twitter and etc, but according to the PMO, our Prime Minister Narendra Modi himself manages his personal Twitter and Facebook accounts. According to the report published in Business Standard, in reply to queries on salaries and the level of engagement with Modi of officials who manage his official Facebook and Twitter accounts, the reply was that "no particular officer maintains them and that his accounts are updated as per information from various officials." However, the PMO did not give any reply to a question on who helps the PM send tweets in foreign languages such as Japanese, Hebrew, Mandarin, Russian and Korean. It, however, put on record that information and broadcasting ministry (Doordarshan) facilitates teleprompting assistance to the PMO. The RTI also reveals that, the PM never got any mobile phone from the PMO. This answer was to a question on whether the PM's phone number could be accessed and what was it. When asked about the internet charges incurred by the PM, his office pointed out it was part of the phone bill and no separate record was kept. Notable, Prime Minister Narendra Modi has roughly more than 31.50 million 'likes' on his Facebook page, and more than 16.8 million followers of his Twitter account on micro-blogging site Twitter.